i prefer the cellphone straps my sister makes, they’re origional and way cooler, she has a site i could link, buuuuut i don’t know the link. plus, paying five hundred dollars for anything that small and then much less carrying it in your pocket on your phone has got to be the dumbest idea i’ve ever heard of (yet, because hello kitty can always sink lower) honestly, who really needs something like this? I can’t even think where/how this would fit on the flip phones most of my friends and I use these days! That’s aside from it being rediculously bling and chavvy! had to finally come out of lunch-break lurking and say hello..
geeze, that much will buy you a laptop!!! OMGOMGOMG I SO WANT THAT! Buy a plastic HK cell phone strap charm thing. Buy some really shiny gold paint. Buy some enamel paint. This is available at hobby stores. Then use painter’s tape, or ‘blue tape’ we call at Home Depot and tape up the parts you don’t want gold. Spray the crap out of the charm, but in an even coat. Do the standard drying in between layers for the desired effect. Then paint the features in enamel paint. Wow, I just made Hello Kitty bling, and I won’t feel so stupid if the thing breaks off and I lose it! Or, for even blingier bling (it’ll cost a few bucks more, but we’re talking maybe $2 US), find a good hobby store and buy a sheet of gold BareMetal foil, and use that instead of the spray can. Now you’ve got me at it too girlfriend; that’s really scary!! Yeah, that would be for the classic French Baroque Romantic or something other look. Other colours of BareMetal are available – ISTR range includes Chrome, Bright and Dull Aluminium, Gold, Copper, Black Chrome, and maybe others. Who would spend more money on the phone charm than on the phone itself????? Appart from a Hello Kitty fanatic that is, but seriously this is ridiculous! If you want gold, buy a decent piece of jewelry people! Too much bling! And no, I would not want to be caught having that on my phone!!! why would you spend so much money to have it dangling off your phone?? … forget the cellphone strap, I could buy TWO NEW cellphones for that money! That is absolutely useless. Not only is it painfully ugly, it costs more than I make in a week. I once again apologize for your position in Hello Kitty Hell, and I hope that someday you’ll never have to see that evil feline again. Tell your wife there’s a worldwide fuel crisis, man!!! I wouldn’t pay that much for a damn phone, much less something completely useless to attach to the phone! Leave it to the morons at Sanrio to come up with something completely useless and ridiculously over-priced all at the same time! Only Darlene would be stupid enough to buy this dam thing……. MHKitty’s got it; that thing should be on a necklace or a bracelet, not a phone! considering how ugly it is, it would be still too overpriced if it was a piece of jewelry. What a waste of $$$! It’s one thing to invest in actual HK jewerly (for which my hubby gifts me) but to pay this much for a cellphone charm is just retarded. Who would spend over $400 on something, and then attach it to one of the most nickable items on a person? I have a Chococat phone charm, but it was $5 at the Sanrio store. They also had “Limited Edition” Hello Kitty purses, which I believe were around $400. At that time I thought to myself “Who in the world would spend $400 for a Hello Kitty purse? Now I know. oh my f-ing god… You could use that as a necklace pendant! It’s terrifying! Especially the price! 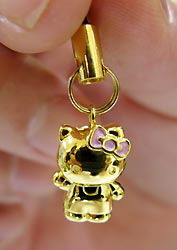 I like Hello Kitty but there is no way in hell I would spend that much money on a phone charm. It ain’t that cute. An 18K phone charm? Really?? Charms break. They fall off their little cord. Then they’re gone. There goes all that money…. maybe charms breaking all the time only happens to me……….. Damn that’s about the same cost as my sidekick…. I’d rather melt these down and cover every party of my body with the gold that wear this on my phone . . .
BTW, Any way that they can make on with Hello Kitty hanging by the area between her head and her body? ?